In July 2016 I wrote a blog post on this blog about community development intelligence in mother’s milk. An unconventional line of thought, all right… but worth considering, to my mind. This morning, an idea dawned on me, in a rather similar style, looking at a stage in community developments way before ‘milk’ comes into play: the conception. In school, talking about the topic of creating new life, it all came across as a rather ‘ random’ process. A couple of million sperm cells, a wide variety of very random examples of dad’s genome split in halfs…… is on a swimming competition to be the first to merge with an egg cell, also a random ripened example of mom’s genome split in half. And yes, this sure seems to be part of the truth of the matter. But.. is ‘being the first’, really what determines which of the available sperm cells merges with the egg cell? Or, is there more ‘ intelligence’ at work, under the bonnet of the biological apparent physical mechanics? I somehow seem to think that the idea of their being some influence of the egg-cell in which sperm cell is allowed in, is not new. Also, it is known that a group has a self regulating mechanism… when ( too) many men have died… (as a result of warfare for example ) more boys will be born afterward than mathematical calculations and statistics would predict based on the ‘randomness’ in the biological mechanics. Other known facts are that ‘females’ not only (highly prefer to) choose their mates, but also that when they have an ‘aside’ from their main partner… the chances of the aside being the father of offspring coming from such incidental encounters alongside the main partner, are quite bit higher than randomness would predict. What if, there is BOTH an element of randomness coming into play AND a very deliberate pick & choose going on of what would be most suitable to invest energy in, in the ‘known’ bigger scheme of things? What if.. there is a collective knowing of what ‘gene expression combinations’ would be most suitable to crossbreed towards the needed/desired ‘results’… the combination of elements that would suit the needs of the community developments best? Not artificially manipulated by people making conscious choices on what they ‘think’ would be desirable, based on way to few data in a way to complex dynamic field, based on the latest fashionable desired traits and forms. But naturally directed by ‘life itself’ on what it knows to serve best given the enormous amount of real-time data in a complex development movement….. in a never changing predestined direction (forward, evolution to an ever higher consciousness)…maybe. Yes, life may launch a great many prototypes simultaneously, to experience and grow experience on what works. But would ‘life’ really waste time and precious energy on creating another prototype it already knows that would not contribute to the development in the desired direction, of higher consciousness? So… them a sperm cell may be ‘the fastest’ to spring into action, wanting to ‘get his stuff in’. If the egg cell taps into the collective consciousness first to find that ‘the result of this mix has been tried and wouldn’t contribute (enough) to the aim of this creation’, it simply doesn’t hand over the key, doesn’t open the door. AND/OR… if the dominant strong sperm cell could manage somehow to force his way in anyway… the product of it gets automatically aborted on the authority of ‘life itself’. Better one egg lost, one conception misconceived and undone within a couple of hours, than huge quantities of energy spent on bringing a specimen, a prototype to life, that is already known, to the energetic collective consciousness not to be able succeed within the desired development direction of the whole. The thought crossed my mind today, dealing with another layer of existence and community developments, than the physical biological mechanics. ( the meta-physical quantum mechanics..probably) . Every ‘new idea’ that comes to being, is a yin-yang mix. And although on ‘paper’ a mix might seem to work and people may think it would be wise to go forward with this development like this, for the ‘seed has been sawn’… ‘ so….let the seedling grow’. The Universe may think ( know!) differently. The same ‘mother’ and ‘ father’ may indeed provide a good knowledge and experience pool for developments in the community, (good energetic ‘genes’ ). That doesn’t mean that any random mix of it serves the community’s purposes well. In this case….. the yin-community is not after conceiving and bringing up any offspring with the dominant genes of the ‘yang’….. (the fastest swimmers, to spring into action, pushing other influences easily to the side)…. The more laid-back ones, not domineering (the recessive ones) are needed, in order not to overshadow the sets of recessive the ‘mother’-egg has to offer. Having an in-depth energy awareness, being able to tune into the knowing of the collective consciousness relatively consciously, is fascinating. the collective consciousness really is like a giant Universal Wide Web of information? it is organised rather similar to the way mankind on earth has organised the World Wide Web of the Internet? you can’t surf it with your mind without being known… like the web knows and needs your IP-adress in order to function? ticks can be (and are) played by people to deny you access to the full free content? How do I get to this line of inquiry? Well, I know that if I am not physically in the Netherlands, my computer is banned from being allowed to see the online streams of television broadcastings… who are free for all people in the country to see. I know that, when one is physically in China, the world wide web seems a lot smaller than it actually is, for there are filters put in place, though which you cannot access unauthorised content. Moving to another place, gives you thus another range of things you can access, while ‘you’ are no different. Who you ‘are’ is nevertheless different, influenced by the location from where you look. But….. there are IP-adress cloaking and altering programs….you can ‘be’ in any country in the world, view what is authorised to view freely from there, while you are physically not in the place the IP-adress you are ‘on’ is indicating. In my experience, the mind seems to work very similar. I can set my mind to match where I physically am and I see what he people around me can tap into and see, all in line with the filters the authorities have put in place which parts of the collective consciousness one is culturally allowed to freely access and use, with which functionalities. To me, it is feels most of the time like setting my modern colour t.v. with dolby surround sound to black and white and mono-sound, with a delay in the broadcasting, giving time to any (live-) experiences to be (severely) censored and narrated in another language in something you know is not original (not in lip-sync). I can also choose to set my mind to match who I really am, a free, not bound to the physical world limitations, spirit and use my original free spirit soul-ip code to logon into the full free on air experience of the collective consciousness. Much more real-time in-depth fun and a full range of relevant and to the point information can be obtained that way. People in China will insist that certain webpages simply don’t exist, while any person outside the county will have easy access to it and can’t understand why it doesn’t show up in Being. Dutch people abroad may be aware of the existence of free streaming-on-demand broadcast services of television programs, but lack the experience of having real joy. They always get ‘ access denied’ when they visit those pages. That squeezes quite a lot of fun out of it. In terms of this website… BOTH/AND…… you don’t have to completely logoff and completely be rebuilt and re-enter (often know as die and be reborn) in order to experience live differently! But some ways of BOTH/AND are more simple and elegant than others. Let’s say you were born in the UK, raised in the UK and currently live in the UK and you identify with the British filters of the collective consciousness to the extent that you choose to be permanently logged in with the name your parents gave your physical UK you form. For instance, your initials are R.A.M. You can then choose to apply plug-in/apps within that setting, enabling you to see the ‘world’, ‘live’ though for instance.. spiritual eyes, Dutch eyes, or French and compare the views. But, default is ‘UK’ …. so, you really have got to put effort in seeing any broader/different pictures, manually arranging ‘settings’ in the mind. Which will constantly ‘flip’ back, to the default. Let’s say, you were born in The Netherlands, raised in the Netherlands and currently living in France. You identify with the free spirit-connected with all that freely is, to the extent that you choose to permanently be logged in with the unique vibration you universal soul has. So yes, I used to use the Dutch ‘identity’ with the initials E.B. as a child, E.K. as a married woman living in two countries, but ever since 2012, I use E.D. on my travels and more permanent stays, an ID that is the short-code in words that matches the identity of my (speed-of-light) being. What is ‘free on air’ in any consciousness, can be picked up in full colour, multi-dimensional depth, dolby surround sound and real time. Speaking ‘ for itself’, not needing any narrating and explaining. If and when I encounter a misunderstanding, a scrambled content, an –access denied-sign….. and wonder why something needs to be cloaked and scrambled here…. I can then simply use the application to mimic being ‘ of that other person’s kind’ and.. ….access granted. I can then understand my fellow human being’s mind a lot better….. for I can see what they are seeing…. and usually also ‘what’s in it for the authorities’ to have set this filter in place. Having seen however the full unscrambled version of the reality play in my mind’s eye, I usually like surfing ‘life’s’ information on my free spirits soul IP-adress much better. It is richer and less confusing, very straightforward and transparent. But, communicating with people about the interesting and useful information that is freely available ‘ out there’, without any hidden agendas tp push me to do or think something … is just as challenging as taking to the Chinese about the full internet experience…..
You logged on for a period of time in 2012 with your temporarily soul IP-adress HC2 in the plugin. And in those days, and when you did, ‘life’ was so much more beautiful, you and I said. We connected easily and shared some magnificent experiences surfing life in real-time , multi-coulour, depth and instant mutual joy. When you decided that you ARE however R.A.M. and even made sure the checkbox ‘ remember me’ was checked on the main logon screen, hardly ever logging on to life as HC2 anymore, you re-disappeared behind the walls of the authorised filters of the British collective consciousness and all you saw were scrambled versions of my and life’s broadcasts, about full harmonious spiritual freedom…..
Those freedoms are not allowed, not ‘liked’ by ‘your authorities’. Of course, I am curious. If and when you decide that you prefer to use your soul IP identity again, HC2, (or another one) we may meet again ‘free in the air’ of Universal Space, unscrambled, unfiltered, unconditional, free flowing our creativity, love and understanding as humans. I am aware, such a decision means daring to be largely and structurally different from your cultural peers. I know, because after having had a play for months with my temporarily soul-IP-adress *V, switching mindboggling backward and forwards between perceptions from the default ‘ Dutch’, I made and effectuated the decision in 2012 to make my free spirit soul address my default state of mind. You did it at the same time, but under severe peer pressure and fear of losing your network in the physical world, you hit ‘ ESC’ and changed it back to R.A.M. Just sending you a postcard from life, an anniversary message, for in this period of the year, it is five years ago we created respectively the add-on identities HC2 and *V and played with our soul-freedom on the extended web of consciousness. I am liking being beyond the manmade boundaries of cultural filters and agendas, I feel so much more ‘myself’, ever since, much more feeling ' alive' and a 'joy within'. Logged on as R.A.M. to the collective consciousness of life, you may not understand a word of this apparent scrambled message, that hurts your mind and leaves enormous gaps in your understanding. If ever you choose to apply HC2 again and play with it….. it very well may resonate again on Universal Truths on freedom of choice and using your mind wisely. I put this message on my blog, for it contains wisdom for other people too. Giving your soul, (your freedom) a name (or listening to the name it whispers to you) and using that, being that, seeing the world though her/his/its eyes….. may first serve as an app/plugin to your default (culturally filtered) identity mind-set…..but may very well be the key to choosing to be a full time free spirit while on this Earth ( who chooses to apply cultural filters only part-time, and enjoy the ‘other and limited experience’ it offers, as an exploration tool). I came across this colourful image and felt it points out something about minding your palette of choice. To my mind, it holds an important clue on managing your social mental emotional, moving it in the desired direction. Apparently this image is founded on the understandings of David Hawkins. The numbers on the left, indicate frequencies of vibrations of the self. 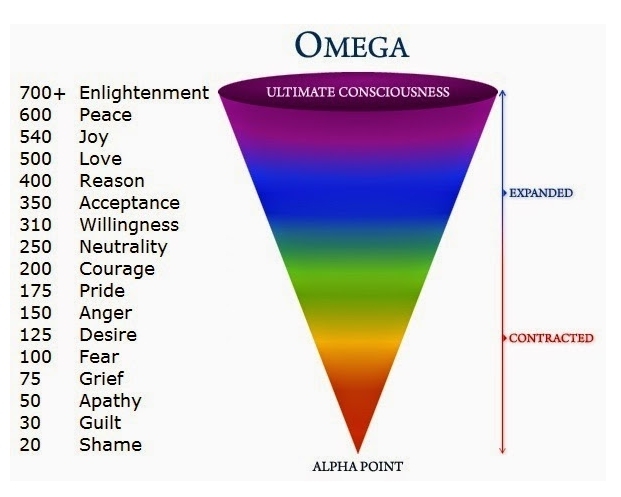 It is a gradual scale (as the rainbow is also indicating) where 17 mental emotional positions have been given a name one might recognise, from talking about inner world sensations. On the right, in blue and red, are markings: contracted and expanded. They indicate the state of mind, the state of consciousness, the scope of the awareness. Although all sensations have a place on this scale, the higher frequencies hold more appeal to most people to experience on a long term day to day bases than the lower ones. The article (about a shift in consciousness) where I found this, stated that most people are currently living most of the time in a bandwidth around the 250 mark. Neutral. Not ‘positive’, not ‘negative’. Somewhere on the threshold between contracted and expanded awareness. Now, often these people speak of a desire (125) to experience more love (500) , more joy (540), and more peace (600) of mind, because they are sad (75) or angry (150) that life isn’t as enjoyable for them as them anticipate it could be. Funnily enough, with my passion, experience and chosen occupation, I often have conversations about these topics with such people, offering to shine my light on the matter, to support them to be able to make this change. I have always maintained that I can work with anyone who is willing and able to actively reach ‘willingness’ in himself. If there is a will, there is a way. If there is no active will, there is no- way change is going to (miraculously) happen. It sounds so simple, but to actively energetically shift gear to full wholehearted willingness, may be the ‘hardest thing’ ever. I often compare it to driving a car. You can’t go backwards and forward at the same time. If you want to change the direction of the movement, you have to stand still and actively put the gearbox into the other direction. From Reverse to Drive, in an automatic car. From Reverse to 1st gear in a manual gearbox. Only wanting it, willing it in the sense of thinking the thought, liking the idea, is not enough to actually achieve this. The active willingness to change the direction of your social mental emotional life dynamics, comes with the ability to completely stop yourself. Which I refer to on this website as the 3 stops ( mini-me-time/transformation time). This, higher in active awareness and energy, overall process-orientated willingness(310) , is therefore very different from passively longing for a certain outcome, the result-orientated desire (125). This morning I suddenly found myself calling the required type of willingness: the willingness to ex-position. Correct English? Maybe not. But it sure is correct Soul-speak. The willingness to ex-position, is the conscious decision to be willing to step away from all previous (= ex) mental positions you are deriving your current sense of identity from. To let go of feeding them. To let go of ‘being’ them. In self-development speak, it is popular to phrase that as ‘ to let go of ego’… which is so abstract that not many people would know what that is, in practical terms and actions. Many interpret this as having to get rid, totally, of their ego (their personal identity). Which is not how I interpret it. When your car driving instructor says:” let go of the throttle’! “ you don’t get you wrench and crowbar out to rip the whole thing permanently out! IN that case, it is easy to understand that the throttle handles the levels of energy added to fuelling the propulsion in the direction you are currently going in right now and functions very well both in reverse as well as in driving forward. Usually this ‘let go’ instruction is followed by ‘ and hit the break’! Where the teacher will emphasize the importance of learning to do that firmly, confidently, purposefully, but not foolishly.. for you don’t want to bang your head on the windscreen or be a unpredictable hazard to other traffic. In minding your palette of choice, changing from the lower frequencies to the higher vibrations, you have got to perform a similar social-emotional mental exercise, to move gracefully from contracted (reverse) to expanded (forward). You believe that you have to feel guilty about taking the initiative for a divorce, in order to be a reliable considerate ex-partner and a compassionate loving loyal child to the parents who you know to feel both ‘trapped’ in a co-dependent marriage. You believe that you have to feel anger for all the hurt your peers, parents, partners, siblings, teachers and co-workers caused over time, in order to be justified as a poor-me victim of life, to receive attention and comfort. You believe you have to be proud on ‘what your people tend to believe and do’, in order to be a worthy representative of your tribe. So hanging onto the emotional sensation may not look that appealing, but letting go of all the social goodies, like attention and acceptance attached to sticking to these positions, appeals even less! For, you fear, internalised and incorporated somewhere deep down, that if you were to let go of these position your survival is seriously at stake. And it is that social mental-emotional position, you desire to survive (life? ), is overpowering any willingness to really experience being alive, full throttle. It is that throttle that keeps propelling you in the direction you actually have great discomforts with. For on soul-level, you being knows that far more important than your physical survival, is the quality of life while living it. On soul-level, you know, that your chances on doing well on both physical survival and genuine high quality social interactions are much higher if you are also able to move ‘forward’ in life. Letting go of the positions you are not actively in, anymore, means letting go of positions strongly related to past experiences, past roles you played in life. It is therefore I call them here ex-positions. And when you are in the no-position, with no-movement, then all options and all positions are open to you, in the here and now. Yes, you can go in reverse, if you so wish. But from here the option to move forward is open to too. From the willingness(310) to exposition, gradually adding energy, you see and accept(350) the positions you are currently in, in you’re here and now. You see the reason (400) why you are here, the direction you fancy taking. You love (500) where you are and were you are going, enjoying (540) the ride, with peace of mind (600) and total awareness (700), even moving at high speed, of what is going on around you (thanks to mirrors all around) and full understanding on how you influence the quality of the flow of all traffic. In going forward at high speed ( high resonances, high vibrations), you endeavour to show up very clearly ‘for all to see’ . You aim to drive at the highest resonances you can currently reach for, timely indicating your intentions to others involved. Really, this exposition of life is not much different from driving a car safely through traffic! So the willingness to exposition has an iridescent multi-perspective, multicoloured meaning in this blog post. Notice as well, that understanding that you are temporarily letting go of all ex-positions, in order to move happily forward on your journey, in a higher position, in a higher gear now… will teach you that you are not ripping out the other roles out of your life experience, the different positions you once had. They just transform, for the better (for all involved) . And so then you’ll know that you don’t have to (and cannot really) ‘stop’ permanently ‘ being in those positions’. But now you can integrate being All You Are, (also the range of 250 and up) without the fear-fuelled need to stick to driving in ‘reverse’. Willingness therefor is to my mind much less about the willingness to 'do' something slightly different, but the willingness to stop, to re-asses the overall direction in your emotional gearbox. Hurry gets very often mistaken for being Happy. And yes, they do have a lot in common! Happy is usually rather quick and often busy, getting many things done very well. Well, Hurry is usually busy with doing many things often very quickly. But ask Hurry and (s)he’ll confirm (s)he is not Happy. Ask Happy and (s)he’ll confirm (s)she is not (in a) Hurry. Happy uses ‘play’ for the story to be told at its natural intended speed and quality in any here-and-now. Hurry runs thought the very same scenes applying ‘fast forward’, all the time. Is it any wonder that these twins have difficulties spending time together in the same space? are Happy and Hurry actually energetical twins, or……. one and the same, only having a different experience with life? The movie guideline, is a really simple line of thought. It honours the spirit of good and fair serious (inter) play. Its wonderment structure, works its magic by creating straight away a harmonious and creative BOTH/AND frame of mind. It is useful for any person who likes to actively endeavour to perform in ways one knows to work best for all involved, honouring their own standards of good quality of life. For if the answer is a wholehearted ‘Yes’, it means you are BOTH pleased now with doing this, this way AND having a clear conscience about your performance, towards any person who might be(come) aware of you acting this way. you are obviously still free to proceed.... in a Universe revolving around experiencing the natural consequences of you exercising your own freedom of choice. In addition to the previous blog post, came this understanding. When two or more people live together, maybe also work together, it can be compared to using the same workshop, as artist painters. When they are living/working closely together, it can even be compared to using the same table on a regular basis. Now picture that there is a person who doesn’t, for whatever reason, clean his dirty brushes in his own jar, but decides to dip them regularly into the jars of fresh water of the other(s)? After a while, the other(s) will start to protest here and there, won’t they? shall be the pivot of uttering some complaints. Clearing and refreshing the jars is not much of an effort, no rocket science at all. Why does developing a pattern of leaving that task always to another, not go down so well in the long run? people will take turns to volunteer to do so. everybody can have the pleasure of staying in the flow of the work and play, without having to interrupt it for clearing their own jar individually every single time, when it gets troubled. it is even perfectly OK, to dip your dirty brush into someone else's clean jar every now and then. But if this natural automatic reciprocation is not happening and it is within in the team always the same people doing the energetic clearing up after the very same other people, to keep the mutual energetic space workable and clean….. than this pattern does affect peace and harmoney on a very deep level: the sense of team spirit. When it occurs temporarily, or for an objectively Very Good Reason where it is clear that a team member can’t be contributing to this part of the co-operation ( but shows then genuine appreciation for being enabled by others to still make clear paintings in this mutual workspace), there will still enough foundation for peace and harmoney. For it is part of team spirit, to give (simple) support to those who really can’t perform a task. The thing is now that clearing energy, is a bit different from taking dirty mugs to the kitchen, or getting a round of coffee for everyone. Not that much, if it is always the same people doing that for the very same others…….a similar undermining of the sense of team spirit is going on! In this case, clearing your/an energy jar is not a physical ‘activity’, but a meta-physical procedure, that is, as I understand it, an intrinsically part of being alive, it is a soul capacity. Anyone alive can ‘do’ it. It is even my understanding that a person who doesn’t clear energy in his own here-and-now in a healthy natural way, for himself and regularly for the people he is actually sharing the same energetic space with….. will experience feeling less and less alive, well functioning as a fully healthy capable human being. The reverse is, to my mind, also true. When one feels to need to make a major change in life, go somewhere else, do something else, leave everything behind, because you feel dull and numb and out of sorts, ‘ not happy’ and experiences all sorts of ‘lack’…. having endless lists of ‘things’ that are missing now, that would really make you happy…. Give a try to consciously clearing your own energy jars! Of course you can probably find a new place where people like to welcome you on the team. For you are so good in telling them nice things about their works of art and about all the other fantastic skills you see in them, for instance. People like hearing that. And you can continue the habit to let other people do the energy jar clearing for you. So, yes... freedom of choice. ....are likely to have a lot of impact on the quality of life as you experience it. How to refresh your clear energy jar? Adding high-frequent small breaks, where you disconnect from all activities and relax your mind. Working on a Dutch website on the importance of taking short breaks on a high frequency ( mini-me-time) to keep your social mental-emotional state clear and fresh, this analogy came up. Any water colour painter will know the importance of making sure you’ve got clear water in one jar. The clear, fresh, transparent water is the carrier of the message you’ll add to it… the pigments you choose to add to it, in any shape you desire to form. It is only, when you use clear fresh water, you’ll be able to preserve the lively light. Which, for those who don’t know this about this painting technique, is in a water colour painting not added by the painter… but is where the base, the paper, is still visible. Not clearing your water on a high frequent regular basis will spoil the end result, so you do keep an constant eye on how clear your water is. Replace ‘water’ with ‘energy’ and ‘water colour painting’ with ‘living’ and you know why I am such an advocate of regularly emptying a part of your system ( the energy-container) in an appropriate place (not over your canvas, nor somebody else’s) and get a refill of fresh clear energy. It goes equally as quickly as emptying a jar of trouble water in the sink, opening the tap, washing the jar and filling it with clear water, before returning to you canvas. You may think:" But I don't like working with clarity...!" "Maybe I am living my life more like an oil painting artist... !? They don't use clear water as a carrier. They don't need transparancy on every layer to preserve the surface of the canvas in places, leaving parts untouched .. !They simply add the touches of light at the end." Well, in real life painting you may have a choice on which techniques appeal most to you and when you master the skills, end up with satisfying results. If you happen to be a living human being..... .you are more than 80% water, in every single cell of your body. You do not end up with satisfying results, being troubled. Refresh your content, at the 'tap of life'...... clear water, clear energy. This blog is written in International English, the fluid ever evolving dialect of people in the Western World who are broadening their mental horizons, exploring different ways of being, beyond their own cultural programming of what is 'right' and what is 'wrong'. One request to all readers, but especially the native English speakers: please assess the quality and usability of the texts on this blog using the dictionary and grammar book of your soul. You'll see that I love expressing ideas to play with much more than endless reviewing a text to correct what is 'wrong' with it according to a rule-book. I write on this blog what I feel inspired to write, when I feel inspired to write it, for the lenght of time I feel inspired to play with it. I hope you'll enjoy exercising your freedom of choice too.